Fifa is to set up a taskforce of 11 people to look at reforming football's scandal-hit world governing body. Proposals for reform will include term limits for presidents and integrity checks for top officials, president Sepp Blatter announced. Fifa will hold an extraordinary congress to elect its new president on 26 February 2016, he added. Blatter, 79, announced he would stand down in June - just four days after being re-elected president. Blatter's resignation on 2 June followed the arrest of seven Fifa officials as part of a United States investigation that saw 14 people in total indicted on corruption charges. A second criminal case was launched by Swiss prosecutors into the bids for the 2018 and 2022 World Cups, to be held in Russia and Qatar respectively. They followed a number of scandals and corruption allegations that had tainted Fifa in recent years. In December, independent investigator Michael Garcia quit Fifa in protest at the way it handled his report into bidding for the 2018 and 2022 World Cups. Candidates to replace Blatter in the February election must be nominated before 26 October. Initial predictions were of a December election, as favoured by several regional football confederations. By the time of the vote, Blatter will have been in office for almost nine months from the date of his 2 June resignation speech. At a news conference on Monday, he did not backtrack on his announcement to stand aside - despite appearing to suggest in June he was reconsidering - confirming: "On 26 of February, Fifa will have a new president. I will not be a candidate for the election in 2016." Explaining his decision to step down, he said: "I had to do something very special and I did it. In footballing terms I would say I kicked the ball out of the field to stop something, this is what I did on 2 June. I'm still the elected president and today I speak with you as the elected president." Earlier on Monday, Prince Ali bin al-Hussein - who lost to Blatter in the May election - had called for the Swiss to leave his post immediately. "President Blatter's resignation cannot be dragged out any longer. He must leave now," he said. Uefa president Michel Platini has been asked by a majority of world football chiefs to stand for the post. It is thought 60-year-old Platini has yet to decide whether he will stand. But following Blatter's announcement, Platini said: "We now have a concrete date which means we can look forward to new leadership, which will surely bring with it new ideas and new solutions. This is an exciting time for Fifa." Term limits for officials, central integrity checks for executive committee members and the disclosing of all salaries and payments to Fifa members will be the main focus of the reform taskforce, Blatter said - although he did not go into more detail. The set-up of the committee would be like "10 players and a coach", he added, with one key person - the "coach" - driving the process. Platini said the creation of the panel was "an important step". Speaking after the Fifa executive committee meeting he said: "We must now make sure that the reforms outlined today will be undertaken in a swift and effective manner. We need to reform Fifa and we need to do it now." 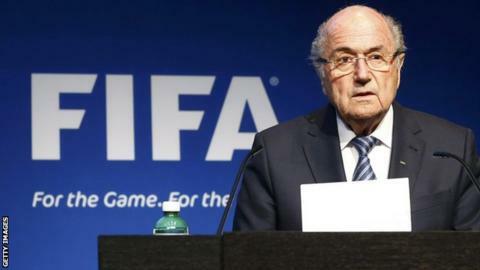 Blatter believes the steps to reform could be his legacy. He said: "I am still the elected president by 133 associations and I will use my mandate as president in a responsibility and mission to make sure that at the end of February I can say Fifa has started to reform and to rebuild the reputation of Fifa." But anti-corruption watchdog Transparency International, citing the fact the committee would not be fully independent of Fifa, said of the move: "This will not be sufficient to win back trust in Fifa." The organisation's director of communications, Neil Martinson, added: "Fifa has promised reform many times before and failed dismally. They have failed fans and supporters today." Campaign group 'New Fifa Now' have written to every Fifa executive committee member asking them to consider setting up a reform commission. They feel the taskforce to be set up by Fifa will ultimately be ineffective and instead prove to be "more of the same". "Only independent reform led by an eminent person drawing on external governance experts to review, develop and implement substantial bottom-up and top-down reforms will result in the systemic and cultural change needed within world football," New Fifa Now said in a statement. "Without independent reform, the global community can have little-to-no trust or confidence in worldwide football administration and management." Monday's news conference to announce the decisions of Fifa's executive committee began in dramatic fashion. The start was interrupted by British comedian Simon Brodkin. Brodkin - better known by his alter ego, Lee Nelson - appeared to offer piles of banknotes to Blatter, before security intervened. As he was led away, Brodkin threw the notes at Blatter, saying "here you go, Sepp". He later went on social media, under the guise of another character, footballer Jason Bent, to declare: "Excited to be at Fifa meeting Sepp Blatter to secure the #NorthKorea2026 World Cup."